Search Engine Optimization (SEO) at its core is the execution of different processes to increase your website’s visibility for keywords relevant to your content. Search engines use algorithms to return the pages most relevant to the intention of the query a user enters into its search box. Search engines are very secretive about many of the factors algorithms use to calculate a site’s rankings. It is causing confusion for website owners and created many misconceptions in the SEO world. It isn’t voodoo or magic like some SEO’s would like you to believe. 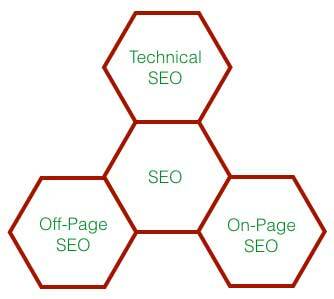 At its highest level SEO can be categorized into three parts Technical SEO, On-Page SEO and Off-Page SEO. 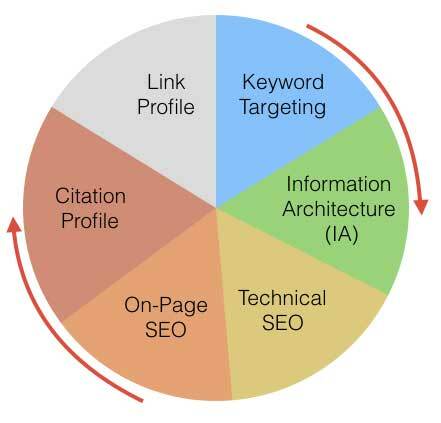 These are of elements that search engines use in their algorithms. Proper use of structured data. Proper use of the robots.txt file. Having a secure site (HTTPS). Optimizing your content for keywords targeted. Proper organization of your website’s URL structure. Optimizing meta tags so search engines understand your content. Create relevant content for each page. Keywords are the foundation of any website. They affect everything from your information architecture (IA) to how you build links. How you approach this process depends on if you’re building a new website or building on an existing site. Some considerations when doing keyword research. What are relevant head terms? Always start your keyword research with broad base keywords. Ones you wish to rank for one day. What is the commercial intent of keywords? If you are selling a piece of software would you rather rank for “buy software” or “free software”? Who do you think is more likely to buy? Many times people searching for “free” have no intention of ever buying. Check what keywords your competitors are targeting. Evaluate your competitor’s keywords and look for opportunities they have missed. Need more help with keyword targeting? We have written an in-depth article “What are SEO keywords and do they really matter?”. At StructuredSEO web design keyword strategies that work. We identify high volume keywords (head terms) and categorize each keyword group. 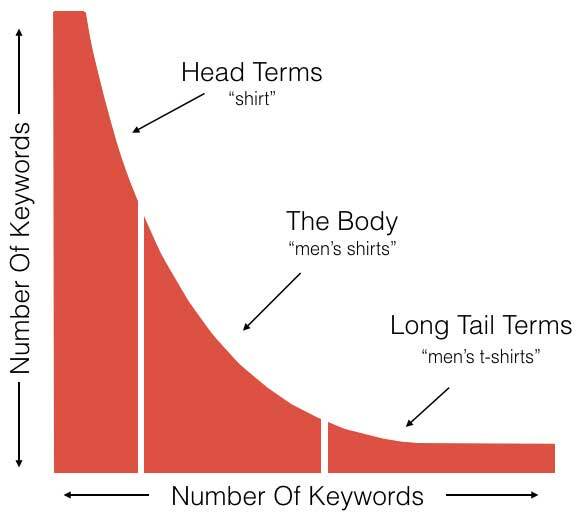 Next, we identify relevant long tail keywords for each head term. Finally, we examine the commercial intent of each category and delivery you a keyword strategy based on user intent and your goals. Information Architecture (IA) is the organization, structuring, and labeling of content in a user-friendly format. Plain English: What information is the user searching for and what is the quickest way to serve up that content? It affects a user’s experience and helps search engines understand your content. When used correctly Information Architecture can have a significant impact on keyword ranking. For example, let’s use an e-Commerce site that sells apparel. The visitor has entered “buy t-shirts” and been directed to your category page or navigated there from your home page. What is the next logical step? Gender, style, brand, size, etc. I’m using “buy t-shirts” as an example because there are so many different options you could include depending on the size of your site and different options you have available. Unless you have a large e-Commerce website, it won’t be this complex. Start with your broadest terms and work to your narrowest. Presentation: How do users interact and visualize your content? Navigation: How do users find more (relevant) information on your site? We believe information architecture (IA) goes hand-in-hand with keyword targeting. When we design your information architecture, we explore your current keyword strategy and site structure. We take into account user experience and search engine’s ability to understand what your content. In the end, we ensure you deliver what visitors are looking for, and search engines have a clear understanding of your content. Technical SEO refers to any SEO done on a website aside from content. For search engines to be able to crawl and index your content properly, it is important to configure your web page correctly. There are many more factors, but these are a few that have been confirmed by Google. Good SEO is built around user experience. The first 2 in our list (mobile optimization and website speed) significantly affect a user’s experience. If you’re not mobile optimized your site is going to very hard to navigate on a mobile device. If your site is slow, then a user will have to wait for a web page to load. On a mobile device, the wait time can be even worse. Having a secure site (HTTPS) serves two purposes. Your visitor knows they can trust you. Search engines feel they can trust you. Blackhat SEO techniques are still alive and well today. Search engines are always fighting to make sure users get what they are looking for not what blackhat SEOs want them to see. HTTPS is another swipe at blackhat SEOs. Blackhat SEOs burn through sites. Many times blackhat techniques eventually get their sites penalized, so they move on to the next. They don’t tend to spend much money on building or maintaining the site. HTTPS costs money. At StructuredSEO we are technical SEO experts. We understand the importance of technical SEO. We design fast, mobile friends and secure sites that are not only indexable by all search engines but deliver exceptional user experience. On-Page SEO is one of the most important factors in SEO. How you optimize your pages affect what keywords it can target. For example, metadata helps search engines better understand the content of your web page. Metadata is crucial in getting ranked for keywords your targeting. Metadata is often referred to as “tags.” Two important tags found on your web page are title tags and header tags. Search engines often display title tags on their search engine results pages (SERPs). The title tag is meant to provide information about your web page to users as well as search engines. Header tags (H1, H2, etc.) are used to structure (outline) your content in a useful manner. Header tags help users, as well as search engines, understand the topics and subtopics of your content. Citations are online references to your business. They are made up of your business’s name, address, and phone number (NAP). These are different than links but still used by search engines when evaluating the authority of a website. Your citation profile is critical. If you have a local business, it signals to search engines the area you serve. For local businesses local SEO is becoming more and more important. The more your business is mentioned in citations, the more likely you are to rank higher in your local area. It is also a possible source of traffic. More citations increase the possibility of a user seeing your business listed. It is vital that your citation profile is accurate and consistent. If you have used a different name, addresses or phone number in the past, this can create a major problem. This inconsistency can be a sign of falsified information to search engines. Your citation profile is important to us. We always review it and notify you of any inconsistency or opportunities for improvement. When you hear someone, talk about link building they are referring to hyperlinks that point to your website from another site. Link building is arguably one of the most important ranking factors. Links are like a vote of confidence. The more votes you get, the higher your sites authority. The higher your authority, the higher your website will rank for your targeted keywords. Links can be detrimental to a site if incorrectly done. Links must be relevant and come from a trusted site. If your links come from unrelated sites or spammy sites you are opening yourself up to be penalized by search engines. Your anchor text should also be natural. If most of your external links anchor text is around your keywords, it doesn’t look natural. Most links are branded anchor text. If search engines see your link profile as unnatural, then you risk getting penalized. We specialize in building quality relevant links from trusted sites. No spammy sites or comments. Combined with relevant content and keyword targeting, we help potential customers find your website. In the end, SEO is about user experience. Your site must contain quality relevant content that is useful to visitors. If you would like to learn more about how we can help you reach your goals, click the form below and tell us a bit about you.